All photos Copyright © Cross Country Nurseries GRANULAR ORGANIC SUPER LAWN and GARDEN - 10LBS - Best for our peppers and eggplant plants, and for incredible production of everything. 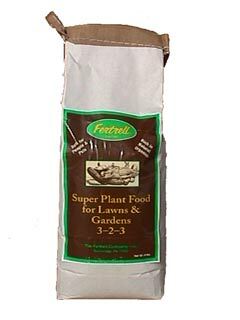 This is a blended general purpose fertilizer with an analysis of 3-2-3 which offers steady and longer term nutrients, as well as activating microbial life in the soil and encouraging healthy root growth. Used top-dressed both in our planting beds and in our larger containers, we find it increases our yields tremendously. Apply at planting, top-dressed. Use 4 Tablespoons per plant (1/4 cup), apply in a ring approximately 3" away from the stem, and scratch it into the soil surface, then cover with mulch. It will take 2-3 weeks to reach the roots. Re-apply 6-8 weeks later if needed, with application at double strength. We do our first application at planting. Prior to planting, soak plants for 5 minutes in a solution of 2 Tablespoons of each of both Liquid Fish, and Liquid Kelp #3 fertilizers, per gallon of water. Free shipping.